Bottomline: With a decent price tag, the 32HD XSMART TV from Kodak is great buy if you expect a wholesome bundle for a reasonable price. Additional smart features give this Kodak TV an edge over other 32-inches LED TVs available in this price bracket. A television is the heart of a “living” room, and attracts direction of our moods as well as all furniture settings. And like all tech that surrounds us, the latent segment of smart televisions is getting impressively smarter and, hence, brands are hawking on it at a global level. 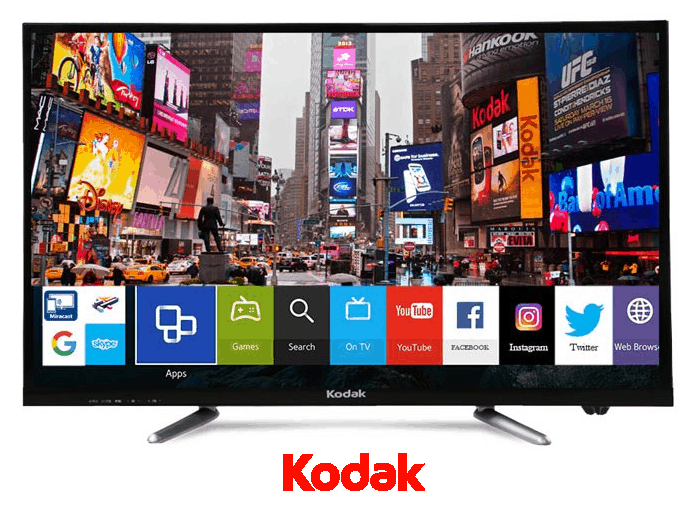 As a pioneer in imaging products which capture moments, Kodak has forayed into much an alien market segment with the launch of five LED TVs, of which one is a 32-inches Smart Television, the 32HD XSMART. With a price-tag of Rs. 15,499, the 32-inch model appears to be an intelligent prospect. First glance at the Kodak Smart TV doesn’t offer a disparate view, save the attractive thin bezels. The build quality isn’t premium but does justice to the price. Kodak claims it to be the first Indian TV with Smart glass protection. Plastic back houses 2 USB ports which allow transfer across plugged devices, 2 HDMI ports, 2 AV inputs, a VGA port, and an Ethernet. One can, however, stay away from wires by using in-built Wifi. With a resolution of 1366×768, the TV is (720p) HD-ready with visible distortion on higher resolutions. This is compensated by great (178º) viewing angles, and rich & vibrant colours. Visual experience can be customized to choice by built-in preset modes like Natural, Sports, Standard, Lightness, Soft and Vivid. ECO button on the remote can be used to toggle between High, Middle and Low brightness modes, saving eyes from straining. The TV can double as a PC monitor, but not advised as the display is grainy & pixelated and lacks colour depth when connected to a computer unit. The Kodak Smart TV offers crisp sound and great clarity with built-in stereo 2X10W speakers performing well with both movies and music, impressing with its audio capabilities. Enhancements include modes like Standard, Music, Movie and Sports. Choosing the right mode to suit your ears can liven up the overall viewing experience. Running Android Kitkat v4.4.4, the Kodak smart TV uses an ARM 1.7 gHz dual-core processor, coupled with 512MB of RAM, which may smother on running multiple apps simultaneously. Hardware is complimented by 4GB of internal storage to store favourite memories. Apps like Youtube, Skype, Whatsapp, Netflix, File Manager come pre-loaded and side-loading of 3rd party apps using apk files is allowed. Talking smart features, Youtube only supports a maximum of 720p resolution playback and while 30 FPS videos play without any noticeable lag, one can observe minor seizures while playing 60 FPS videos, due to lack of RAM. FPS or frames per second measures the rate at which display devices play successive images or frames. The Air mouse which comes with the package can be used to browse through the “smart” interface, use apps and play games. If you fancy playing games on big screens, you can feast on flavours of light games like Glow hockey and Tetris available in the Google Play Store, but even moderately heavier games like Fruit Ninja and Angry Bird often crash, mostly even before gameplay. The retail site boasts of Miracast Wireless display feature, but we were unable to connect it to any Android or Windows device. While other models – 40 and 50-inches – are also available on Flipkart and Amazon, the 32-inches variants (both Smart and non) retail exclusively on ShopClues. Kodak is not making these TVs itself, and have licensed their trademark to Noida-based producer SPPL (Super Plastronics Pvt. Ltd.) for manufacturing of these new TV sets. This can also be a great gifting option in the brewing festive season, without burning a hole in your pocket.